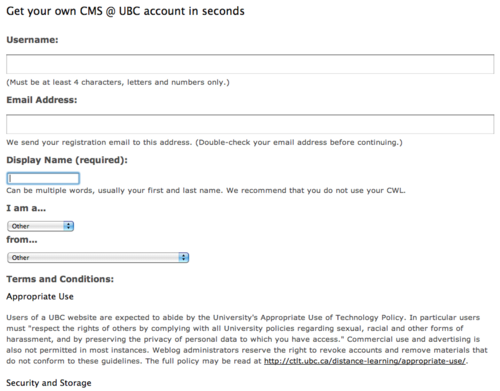 The CMS service is geared toward members of the UBC community that have a need for a common look and feel website, and as such, are often faculty units, administrative departments, campus initiatives, etc. It is recommended that individuals look at UBC Blogs for personal web publishing solutions. Go to https://cms.ubc.ca/ (bookmark this for the future!) >> click on the LOGIN button and enter your CWL information. Your Username is permanent while you can change your Email Address and Display Name. sebastien May 11, 2014 at 4:08 pm Permalink | Log in to reply. doesn’t tell me what I can expect my website address to be? were will it be hosted?